Special Containment Procedures: SCP-3140-1 is stored in an enlarged containment hangar at Armed Containment Area-40 in an inactive state, with access to an underground testing area. Any testing must be approved by Level 4/3140 personnel. During testing, the 3140-S subject must be watched by researchers and security outside of the testing area. Upon conclusion of testing the anomaly must be deactivated and brought to its chamber. Investigations into the uses of SCP-3140 in Daevic society and whether other instances of the anomaly exist are ongoing. Revision 1: Level 4/3140 approval is required for the planting of seeds recovered from SCP-3140 instances. The guidelines in Document 3140-HRT-1 must be followed for the initial planting. Revision 2: SCP-3140-2 and SCP-3140-3 will be stored in enlarged containment hangars at Botanical Garden Beta. Level 4/3140 approval is required for testing with either or both of anomalies. 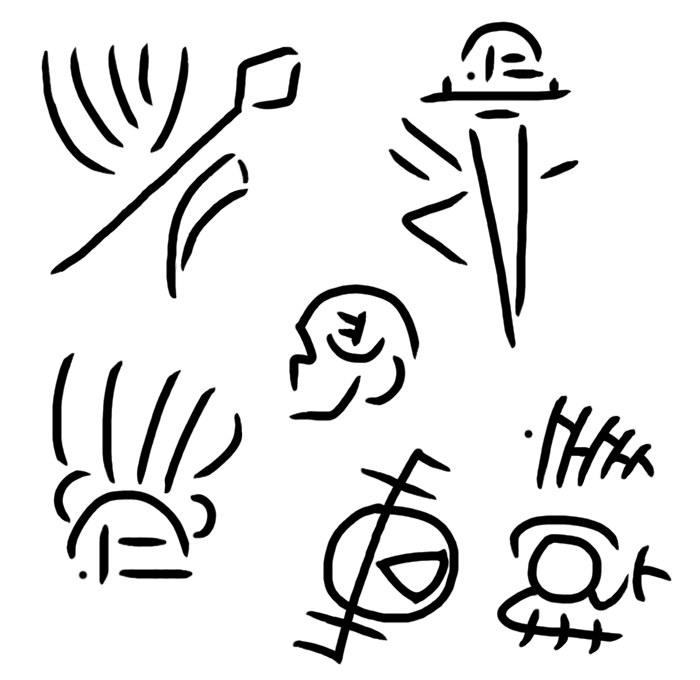 Recreations of symbols carved onto the surface of SCP-3140-1. Description: SCP-3140-1 is the only extant member of SCP-3140, a group of arboreal entities. SCP-3140-1's body primarily consists of Cupressus gigantea1 and Prunus serrulata2 bark and wood, standing at a height of 12m. The "torso" of its body is roughly spherical, with multiple flowering cherry branches and small cherry trees growing from it.3 The anterior side has a stylized eye etched into it, which is surrounded by illustrations of Daevic weaponry, cultural symbols, and skulls with seven eye sockets. The posterior portion has a circular Thaumic Glyph Pattern (TGP)4 with a radius of 26cm, which prevents fire and erosion damage. Three anterior-facing wooden barrels (1m long and 28cm wide), with a single hole on the front, are on the torso. One is attached above the right leg, one extends from a dorsal branch on the right side, and one is positioned 1m left of the eye symbol. Two wooden digitigrade legs are connected to the sides of the anomaly. These legs possess full articulation, due to the wood at the joints being intermixed with an unknown green and pink substance (designated 3140-C). The legs are ornately carved with iconography of Daevite soldiers killing and eating people, soldiers with unidentified megafauna and entities resembling SCP-3140 besieging castles and cities, and slaves being given to the Daeva5 matriarchs. The bottom of the left leg features a hand-shaped recess with a depth of 11cm, with the phrase "For the conqueror" written in Daevic found in the center. The feet have three long toes; two anterior and one posterior. In an inactive state, SCP-3140-1 sits in a crouching position. Any subject, hereafter designated 3140-S, that places their left hand in the hand shaped recess and says the Daevic word for "awaken" will activate SCP-3140-1, making it stand upright. The anomaly will begin to follow 3140-S and will follow directions said in Daevic. Directions that SCP-3140-1 is incapable of achieving will not be followed. Saying the Daevic word for "sleep" will bring the anomaly back to its inactive state. Any 3140-S may reactivate SCP-3140-1 at any time by saying "awaken" within the anomaly's vicinity in any language. "Move": SCP-3140-1 moves to a location 3140-S points to. "Stomp": SCP-3140-1 moves to and stomps at a location 3140-S points to. "Stab": Various bone spikes (~25cm long) emerge from every surface of the anomaly.6 These retract after one minute. "Slide": A mix of translucent low-viscosity substances cover SCP-3140-1, falling off of it after three minutes. "Heal": Resin seeps from random locations on the anomaly, primarily around the barrels. "Fire": Smoke emerges from the barrels on SCP-3140-1. See Document 3140-CLIST for further commands. Photograph of the dig site. SCP-3140-1 was discovered at a Foundation archaeological dig site near Bikudo, Jammu and Kashmir, Republic of India on 27-January-2017. The dig site appeared to have at one point been the location of a battle between Daevite forces and an unknown Ortothan7 group, based on the presence of non-anomalous weapons and armor possessing acute heptagrams (sometimes surrounded by other polygons), regular polygons (ranging from four to seven sides), and humanoid figures with four to seven arms. Said battle is believed to have occurred at some point in the Early Low Daevic period (c. 11000 BCE), suspected to be the Century Conquest8. Around SCP-3140-1's legs were chained legcuffs made of meteoric iron, locked with a complex mechanical system, with the phrase "Ruination to the invaders" written in Ortothan on both cuffs. The chains had been heavily damaged, likely from attempts to break it. 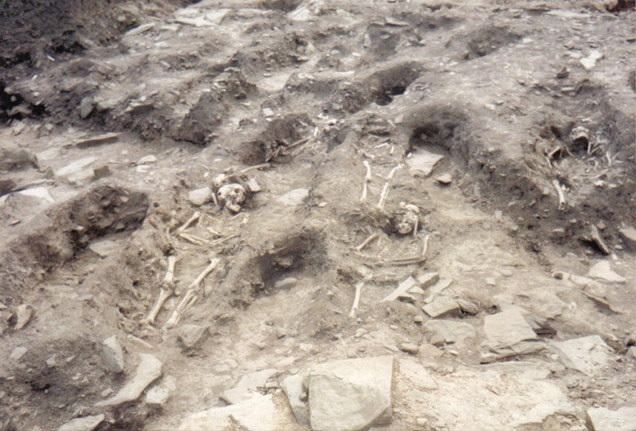 The remnants of an SCP-3140 instance were found at dig sites in the vicinity, which had damaged legs and a destroyed torso. The torso's remains had a solidified mass of miscellaneous plant matter and bone fragments in it, connected by multiple small roots. Other objects in the area included bones, weaponry, and armor. All artifacts, the destroyed instance, and SCP-3140-1 were transported to Area-40 on 29-January-2017. Based on texts found in SCP-1726 and SCP-140, SCP-3140 were a common weapon utilized by the Daevic Empire during and after the Century Conquest, though it is suggested that the anomaly had predated Daevite civilization.9 Thaumaturgic horticulture methods would be used to grow different variations of the entities, primarily designed for military application. Below are several text excerpts detailing the growth and usage of SCP-3140 in Daevite society (translated). Next to the prisoner slaughtering grounds I saw a massive farm. It stretched out from the clearing—which I estimate it to be 60 urvs long, 50 urvs wide—and past the corpses, possibly farther. I estimate the clearing to be 61 urvs. Many growing and grown Amunj are in the plots, possibly one hundred or more. The area has less guards, though many experienced presence aether-benders occupy it. A hill in an unguarded region gave the perfect view, and the Holy Rays Tube—praise the Elemental Holies—improved it. Daevic—death to the brutes—aether-benders walked the columns and would stop by the mature and crouched ones, then retrieve objects from their red robes. Aether-black would flash in their hands as they retrieved the materials and inserted them into the Amunj, which rippled like water during the process. I could not easily glimpse the materials for they were clouded by the aether-black-air, but the Holy Rays Tube—praise the Elemental Holies—illuminated spirit-residual outlines of bone and flesh. After the process ended a quick change would occur to the golem: Tentacles like the Deepers'—I suggest an investigation to see if a Deeper pact was formed—cannons of great size and with many barrels, and spikes to rival our spears all grew instantaneously. The aether-benders would move on to the next, and a soldier would lead slaves—likely captured warriors—by chain to the wooden beast. They were all starved and scarred, and trembled with every step. If they did not begin to etch Daevic—death to the brutes—victories and violence onto the golems, a small rod would be stabbed into their back and they would immediately return to work. Some of these artists had dozens stuck into them. The first attackers were Daevic soldiers, who emerged from the jungle at the early sunrise to assault the gateway. Luckily our warriors were as prepared as the Tenth Y prophesied and promised, for they had a great many traps, weapons, and strong fortifications. Our archers up on the wall did little to assist them, and the onlookers up here, myself included, cheered. We knew the Daevite Empire was the greatest to ever exist, so this victory was truly glorious. I was nervous, though. The countless stories of endless victories and the taming of great beasts that belonged in other realms came back to me. An attack with so few soldiers seemed wrong. After a jolon had passed with no new action the crowd around the archers grew smaller, but our good warriors stood strong with anticipation. Another jolon later most had left to return to their homes in or around the inner city, and the archers began to speak about unrelated events. Unusually the chimes of safety had not rung despite the apparent victory. That was when I heard a rumble and saw trees swaying from my window. Suddenly, three large beings of wood and leaves rose above the horizon. Their bodies were like castles of wood, and their legs were larger than any tree trunk I have seen in my hunts. Each had vast numbers of Daevites scrambling along stairwells lined with bark plating on the exterior and on fortified platforms, covered by large trees. Strange pink and blue flowers blossomed all over. A few holes I could see on their fronts suggests they have an interior as well. The hundred cannons fired in unison from the top and middle of the wall, but the tree beasts kept walking. More and more were fired and only small pieces of the things would shatter. The ground troops were being attacked from all sides by smaller wood creatures, some still taller than any man. I saw a man have spiked vines wrap around his body and rip him like cloth, and another was impaled by several wooden spikes. The traps and barricades were stepped on and broken, and the archers and cannon workers were killed by Daevite's arrows. As they got closer to the top of the wall I grabbed all I could and ran from my home and into the city. A jol later I heard the chimes of invasion ring from all around. Clouds swirled in the sky as my boat sailed along the coast. As with all Sanc creations, it was efficient and simple, but I feared it would collapse at any moment. After an uro I was able to see the edge of the Ytan clan's village, the rest was hidden in dense foliage. The Masn Codexes claim the clan to be a relic of Empire Daevic, a Fragment Daevic. A much debated idea, as none could verify from risk of death or worse. This day I could see well that they were Fragment Daevic. Huts and sculptures of bone were common, occasional villagers and guards walking around. The only crop I saw was a large and thin tree, growing slices of meat on the branches. Guards would grab a slice and eat, and another would grow soon after. A likely solution for the few animals and humans that could be fed on. Small Uosho, wood deities tamed and used for war, were fishing using tens of arms on their fronts. Once all arm claws had grabbed a fish, they would drop them into a basket that would then be put into a hole on another Uosho. This one would then trudge into the forest, vanishing. This repeated without end. Full texts and artwork related SCP-3140 instances can be found in Document 3140-HISDOCS. The use of SCP-3140 decreased over time, gradually replaced in favor of thaumaturgic mechanical weapons. However, some Daevic clans continued to use the entities for hard labor, farming, and protection. The last remaining ones are suspected to have been destroyed by forces under Chinese general Qin Kai circa 270 BCE. A section of Botanical Garden Beta. Addendum.1: On 1-March-2017, two seeds (designated SCP-3140-2 and SCP-3140-3) retrieved from SCP-3140-1 were planted in an enlarged botanical garden (Botanical Garden Beta) in Area-40, following Daevite horticulture instructions found in Documents 1726-801 and 1726-822 (compiled in Document 3140-HRT). Said instructions utilized multiple anomalous compounds and thaumaturgic rituals, carried out by Thaumaturgy Division personnel. 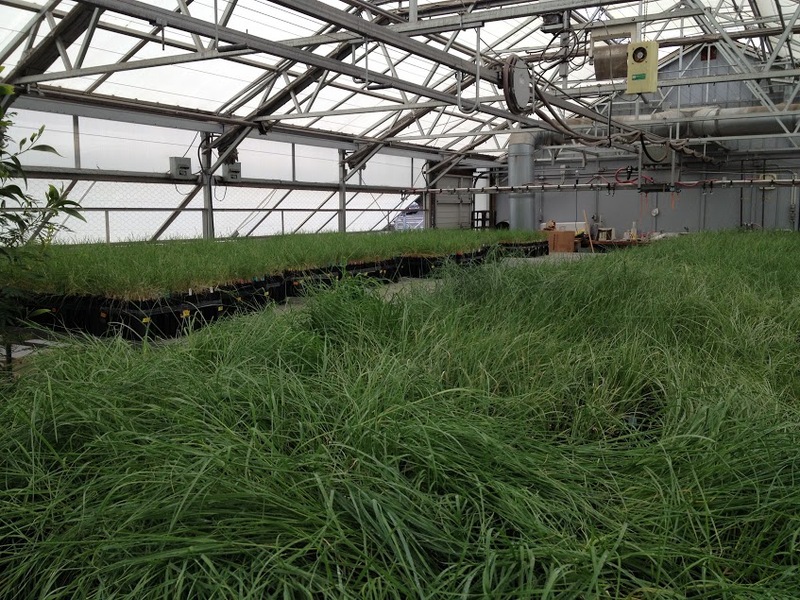 SCP-3140-2 would be grown without modifications being made, while SCP-3140-3 would be grown for use in farming. By May several wooden spheres with small branches extending from them had grown, and by July growths resembling legs had formed. Addendum.2: On 5-September-2017 SCP-3140-2 and SCP-3140-3 had fully grown and had broken out of their dirt plots. Following their relocation to separate containment chambers, testing regimens began. SCP-3140-2 is largely the same as SCP-3140-1, though it lacks any inscriptions, etchings, or barrels. The anomaly is unresponsive to the "fire" command. The leading explanation for the lack of barrels is that they were added to the entity after it had fully grown, which is unlikely to carry over to offspring. Research into adding these onto the anomaly is ongoing. SCP-3140-3 lacks the same features as SCP-3140-2, and has a largely different body structure than SCP-3140. The entity has a height of 4 meters and a 3 meter wide torso. The underside possesses a mass of tendrils made of wood and 3140-C, each of which have a different structure. Personnel have successfully used SCP-3140-3 in the cultivation of soybeans, rice, tumeric, and sugarcane with various commands, using the tendrils to achieve this. However, the process is slower than existing mechanical farming methods. Further research is being performed to see if SCP-3140 instances could be utilized by the Foundation, which includes tests to see if instances could learn new commands after growth. 3. The blossoms do not require any sunlight and nutrients in order to grow. 4. Patterns composed of many interconnected thaumaturgic symbols. Daevic TGPs often had hundreds of symbols within small spaces, and were commonly created by skilled thaumaturgic artisans. 5. The leading theocratic aristocracy in Daevic society. 6. Multiple spikes have broken and disintegrated during testing. 7. A set of mythological and religious beliefs based around the universe being the second universe to exist. This is typically paired with the worship of seven universal guardian deities known as the Koru-teusa, of which six have died. 8. A war waged by the Daevites on wide number of civilizations in Asia, lasting from 11039 BCE to 10939 BCE. 9. Based on the leading theory that [REDACTED] relic, the anomaly was substantially modified from its original form by Daevite horticulture, only resembling SCP-3140 not long before the Century Conquest. The original purpose of the anomaly is unknown.